I am here with a fun Christmas card to add to my collection. My amazingly awesome son found this adorable stamp for me at a thrift store. It's so perfect! What kitty doesn't love watching birdies through the window??? 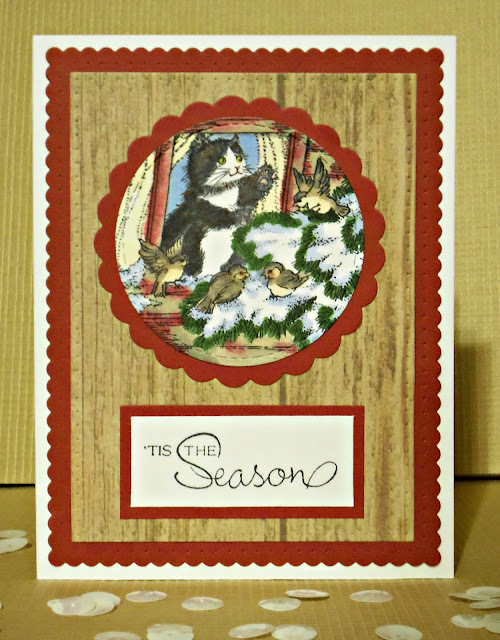 My wood grain patterned paper background was inspired by the the June Winnie & Walter Rerun Challenge with the Scenery: Into the Woods as the featured rerun set. I don't own the set but I got inspiration from the stamped wood grain background and white sentiment panel on Shay's colorful card HERE. Hope you enjoyed this sweet kitty card. Hope your week is going well. Thank you so much for your visits and comments!!! So adorable! Thanks for joining us at Die Cut Diva's! Beautiful card, I love the woodgrain. Oh that kittie wants outside all right. hee hee A cute Christmas card. Such a cute card! Thanks for joining us at Penny Black & More and good luck! Cute Christmas card.. Thanks for joining us at CHNC Patterned Paper Challenge this month. Gorgeous card Janis! The image is so sweet and the deign is lovely. Awwww,that kitty Christmas stamp is SO cute! You colored this scene so beautifully that I can almost feel that soft cat fur. Sw sweet. 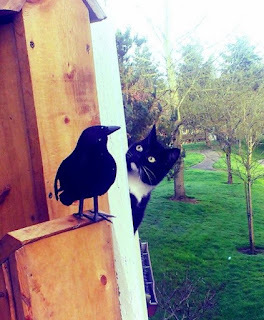 I love the cat watching the birds on the tree and wishing to be outside too. Very sweet, so cute. So glad you joined us at Die Cut Divas this month. Cute!! Thanks so much for participating in our CHRISTMAS CRAFTS ALL YEAR ‘ROUND challenge. Hope you participate in our next challenge!! Have a happy crafty day!!! What an adorable image and lovely Christmas card! You have the best son! Thank you for linking up to Three Amigos! Thank you so much for joining in with ARTastic this month.